A new condominium project by Cressey is now underway here at the False Creek James Condos in the Vancouver real estate market. Contemporary architecture featuring one hundred and fifty five designer Vancouver James condos, this False Creek condo project is located in a vibrant and exciting new neighbourhood close to the 2010 Athlete’s Village and the beautiful waterfront district. James at False Creek is a new presale development featuring interiors that are beautifully designed, open layouts and amenities that provide a great lifestyle balance for homebuyers. This progressive False Creek Vancouver condo project at James by Cressey is both intimate and thoughtful according to their marketing. The building itself is elegant and sophisticated and creates a landmark building in the False Creek Vancouver neighbourhood. A combination of glass, steel and concrete come together with amazing balance and striking facades, making the Vancouver James at False Creek condos for sale some of the most beautiful homes in the neighbourhood. In addition, no two elevations are identical, making the project truly unique. The Vancouver James False Creek townhomes are open and encased in walls of glass, providing amazing views and an abundance of natural light. The main James False Creek condo tower features high-end residences that provide sweeping views and amazing interiors. 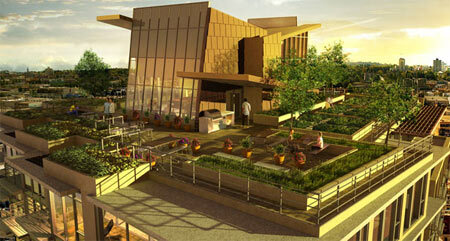 The entrance way, lobby and breezeway are all inviting and the grounds are professionally landscaped. Rafii Architects is behind the design of the pre-construction Vancouver James at False Creek condo building and townhomes. In addition, the presale James Vancouver condos in False Creek real estate community will be LEED silver certified, creating healthier living spaces for homeowners. 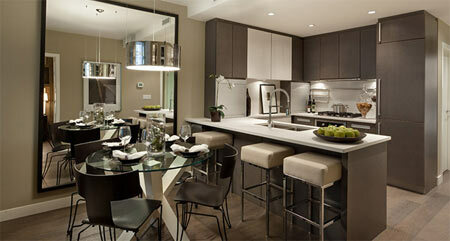 Own at James False Creek Condos May 15th! The small details and high-end finishes make the new Vancouver condos at James at False Creek very unique to the market place. From prominent features and finishes to brand name and high-end appliances and from custom cabinetry to beautiful imported floors, the James Vancouver False Creek condos for sale are defined by the quality and attention to detail in every home. Some of the kitchen features here at the pre-construction Vancouver False Creek James condos include contemporary cabinetry with task lighting, sleek composite stone counters with backsplash and eating bars (as per plan) in addition to stainless steel double bowl sinks, designer faucet with vegetable spray and wine storage shelving in functional kitchen islands. In addition, the presale James False Creek Vancouver condos for sale will include soft close cabinetry, fully integrated Blomberg bottom freezer fridge, Fagor 5 burner gas cooktop, Euro style convection wall oven, dishwasher and Panasonic built in microwave to name a few high-end appliances. The luxurious bathrooms and master ensuites at the presale James Vancouver condos for sale in Southeast False Creek real estate market will introduce designer vessel sinks, dual flush toilets, recessed pot lights, contemporary hardware, frameless glass showers (as per plan), designer porcelain tile tub and shower surrouns, large format porcelain tiling, contemporary custom cabinets, medicine cabinetry and luxurious limestone countertops too. All new Vancouver homes for sale at the Cressey James at False Creek condo living will feature air conditioning system, five inch wide plank brushed engineered hardwood, in suite storage areas, laundry closets with washer and dryer (stacked) in addition to large format tiled floors and frosted glass doors to the dens. The ceilings are completely smooth and there are outdoor living spaces in every James at False Creek Vancouver condo floor plans. There are five inch baseboards in every room in addition to the finest finishes you will ever see in a Vancouver False Creek real estate development! Fight Cancer with James False Creek – Thank you to everyone who attended the Fight Cancer with James event this past Thursday! It was a hugely successful event where Cressey donated $10,000 to the BC Cancer Foundation on behalf of all those that attended. In addition, Cressey has decided to double this amount which means $20,000 will be donated to this worthy cause. Visit the Vancouver False Creek James Presentation Centre open everyday except Fridays from 12-5pm to view these air conditioned boutique Vancouver homes in False Creek real estate market. We are more than happy to walk you through our 1 bedroom and den showhome and point out all of the details which makes James Vancouver Condos the best value in False Creek. Thank you again for supporting the Fight Cancer with James False Creek event with donations going to the BC Cancer Foundation. Fight Cancer with James Vancouver Condo team at Cressey Developments was an enormous success, and the community and cancer research fundraisers and supporters all thank you for a job very well done! If you are wondering about the on site amenities in this False Creek condo building, homeowners will be able to enjoy everything from a beautifully landscaped community that includes a breezeway with granite inserts, water features and art in the entrance lobby. Also, the Vancouver James Condos at False Creek features an on-site concierge for security and conveniences to help with everyday errands in addition to a fully equipped fitness gym with steam rooms, sauna and yoga/pilates studio. Other onsite amenities at the pre-construction Vancouver James condos in Southeast False Creek real estate market introduces a thoughtful are program, cozy fireplace lounge with large screen television, and a great business centre. There is also a rooftop terrace called the James UP which includes a catering kitchen, BBQ area, garden plots, children’s play area and professional landscaping. Homeowners can also enjoy the incredible views of downtown Vancouver from the James UP False Creek clubhouse. James at False Creek condos are developed and built by Cressey Development Group and designed by Raffi Architects. Responsible living is the key to the success of this Cressey James condo project which is built for healthy living using intelligent and low impact building materials. In the end, the False Creek James condos will be LEED Silver certified through the use of earth friendly materials and building construction processes, Energy Star appliances, co-op car sharing, charging stations for electric vehicles in the underground parking, water efficient plumbing and fixtures, low VOC paints, sealants, adhesives and innovative design processes. Overall, these new Vancouver James at False Creek condos will be built GREEN and LEED certified, making your life that much more healthy! The most important amenity is its location. Situated in the Southeast False creek Vancouver neighbourhood, James by Cressey is close to public transportation (including the bus, street car, SkyTrain and Aquabus) in addition to the 2010 Athlete’s Village (Millennium Water), the waterfront seawall/boardwalk in addition to community shopping, dining, recreational facilities, schools and services. Download a James False Creek community map online today. As the new James at False Creek Vancouver condo project is currently in the pre-construction phase, Cressey will be launching the floorplans soon during the VIP preview. The Vancouver James at False Creek Condo Presentation Centre is coming soon to 289 West 2nd Avenue, Vancouver. For more information regarding the Cressey James Vancouver condos, please refer to the MAC Project Marketing site at www.jamesliving.com to register your interest for the VIP previews coming soon. The eventual location of the Southeast False Creek Vancouver James condos will be at West 1st Avenue and Crowe Street. James by Cressey is an intimate collection of only 155 contemporary and boutique Vancouver condo residences in the exciting new South East False Creek real estate neighbourhood. James at False Creek living offers thoughtful details both within each home as well as within the condominium building and is centrally located near South Cambie Village and the Canada Line SkyTrain Station. 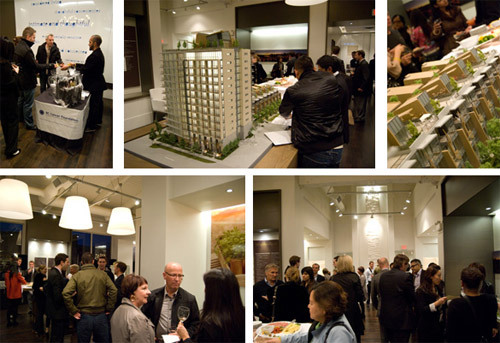 Stay tuned for more information about the pre-construction Vancouver James VIP Preview and sales launch event. Hinge Park False Creek! The forecast is calling for some sun this weekend so it looks to be a great time for you to enjoy the spectacular seawall and newly opened Hinge Park located in the Southeast False Creek community where the new Cressey James condo building is located! The neighbourhood continues to come together, getting more complete everyday which means the secret will soon no longer be a secret as to just how amazing this neighbourhood is. Named after its hinge-like twisitng location, the public greenspace at Hinge Park False Creek serves as a play park, wetland, dog park and all around great place to catch in the city and mountain views. Visit us today! Take advantage of your weekend and visit both Hinge Park and the James False Creek condo presentation centre which is less than 5 minutes away at 289 W 2nd Avenue. The fully furnished Cressey James False Creek condo showhome is open for previewing everyday from 12-5pm and closed on Fridays. We have two architectural models here at the new False Creek James condo presentation centre by Cressey developers, view images and a full set of floor plans all available at our presentation centre so we encourage you to stop by and experience it firsthand. You can also always give us a call at 604.675.1000. 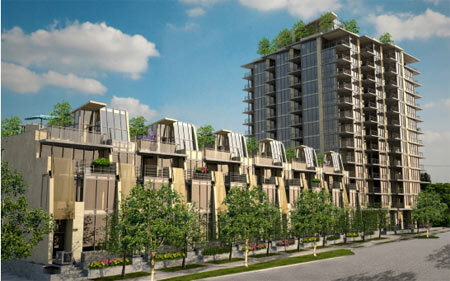 James Vancouver condos, Cressey’s new development in South East False Creek real estate market is now ready to launch! We realize it has been a little while since your registration, however we are now open and are excited to invite you down to see our Vancouver South East False Creek Vancouver James by Cressey Presentation Centre and introduce you to this fabulous new development! After a number of years of extensive planning, the Southeast False Creek Master Plan is beginning to take shape, most notably with the completion of Athlete’s Village. 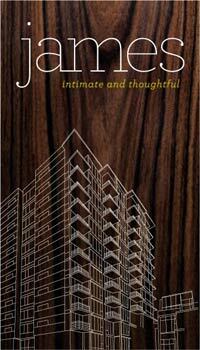 James by Cressey Vancouver condos is your opportunity to be a part of this community. You can learn more about James in this Overview as well as Southeast False Creek James Condo Features and Amenities. We are currently previewing and anticipate going to sale in early April 2010. I will have finalized Vancouver James condo floor plans this weekend, and preliminary pricing will follow. I encourage you to visit our Southeast False Creek James Vancouver Condo Presentation Centre as soon as possible so you have the opportunity of securing a home of your choice. We are located at 298 West 2nd Avenue, Vancouver and are open everyday except for Fridays from noon to 5 pm. If you have any questions or would like further information please don’t hesitate to contact me via phone or email. I look forward to speaking with you soon. Warmest Regards, Judy at C. 778.772.3419 or P. 604.675.1000. A recent profile article in the Metro Vancouver Condo Guide explains how the boutique collection of 155 Vancouver James False Creek condos is one of the most sought after addresses in this amazing new community. Just steps from West 1st Street and Crowe, just seconds away from the new False Creek Vancouver seawall, the James condos now selling feature an astonishing 39 individual and unique floor plans that range from urban flats, traditional loft style residences, spacious townhomes and luxurious two storey condominium homes. The lush pocket gardens and rooflines are both contemporary and West Coast style, making the new Vancouver James False Creek condos a very attractive choice among homebuyers looking for modern urban spaces. One of the incredible features of the James False Creek Vancouver condo building is it’s five thousand square foot rooftop deck that has an outdoor kitchen, lounge space, children’s play area, solarium style seating area and garden plots for residents. In terms of the interiors, the new Vancouver James False Creek condos feature avant garde colour palettes with lots of millwork, high end appliance set, appliance garages so that you can tuck them away from the counter as well as soft closing drawers. Not only that, but the unique James False Creek floor plans feature spacious exterior balconies/decks and the living rooms have built in display shelves, more storage and amazing bedrooms (some with large windows and views). Another premium feature at the luxury Vancouver James False Creek condos for sale is that every suite has air conditioning for year round comfort. From the Art Gallery to Granville Island and from the new Canada Line to downtown Vancouver, James False Creek Vancouver condos are central to everything you want. Also close by SkyTrain is downtown and the airport. The James False Creek condo presentation centre is now located at 289 West 2nd Avenue, Vancouver, BC and is brought to you by Cressey.